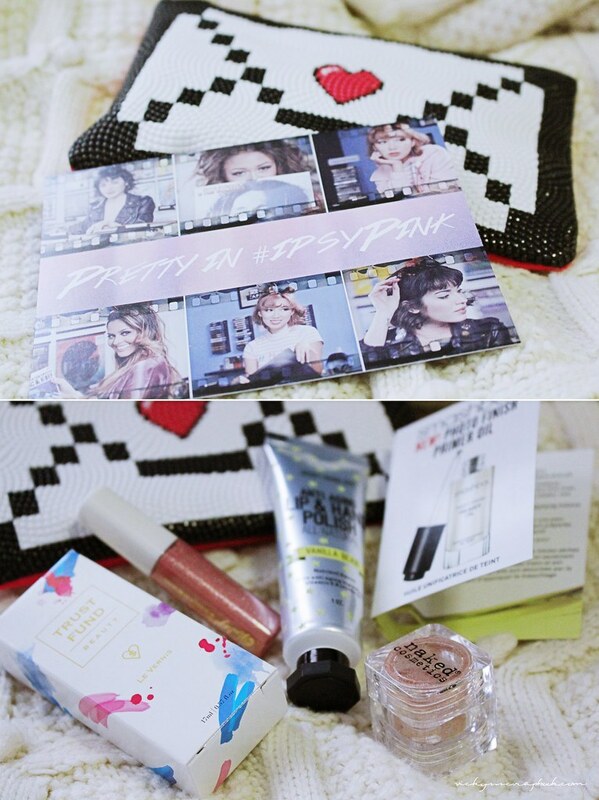 The theme this month for Ipsy is Pretty in Pink and the colors of the items are very feminine and romantic. The color of this nail polish is so lovely; I’m King of a Big Deal is a really beautiful baby pink. I’ve personally never heard of this company but it’s a vegan and cruelty free company. Another product received is a sparkling lipgloss that’s of course also in a very pink shade. It claims it has a “sheer, reflective formula provides luminous shine and sophisticated shimmer”. I received another exfoliating item this month but this one is geared towards the lip and hands. I thought it was a hand cream at first due to the packaging. It claims it’s “made with all natural brown sugar, vanilla bean extract, anti-aging vitamin E and nutrient dense jojoba oil, shea butter and plant extracts”; it sounds a product worth trying. I’ve been looking into trying a new face primer lately so when I got this one in the bag, I was pretty thrilled. I’ve never tried a primer oil but since “this fast-absorbing hero blend of 15 essential and lipid-rich plant oils penetrate instantly to moisturize your face for seamless foundation application with a dewy, youthful finish”, it seems like a perfect primer. This is probably the most interesting item I received in the bag. I didn’t even know exactly what it was for. After some research, I figured out that this is just pigment that is for flexible use on any part of the body. I have a pretty good feeling that this will call for a lot of creative uses. Though one thing that I didn’t quite like is the packaging; before I even opened the jar, I already saw some glitter on my hands and I know this is going to be a pretty messy product. The makeup bag this month features a really simple and cute envelope/mail design. It has a nice pebble texture on the front of the bag and a smooth pink back. For Birchbox, I chose the Date Night theme, which is aimed at creating an effortless evening look, and a majority of the items received were sample sized. The blowout spray was one of the products I was excited to receive in this month’s birchbox. It’s a “lightweight spray [that] works on both damp and dry hair to give you the perfect blowout, protecting, nourishing, smoothing, and volumizing hair”. I’m in the middle of trying out the product and if it goes well, I might purchase the full size. I love receiving mask especially these wash off mask. This one is “to refresh and renew skin, revealing a smoother, brighter, trouble-free complexion”. It also seems to be aimed at “random pimples, dryness, and flakiness” which is perfect of me. This is a highlighter which gives a “subtle sheen that lights up your features”. Personally, I’m a fan of the Benefit Girl Meets Pearl and since this product does sound very similar, I feel like I’ll like it. In the packaging, it even comes with a template on where it suggests you could use on your face. Ipsy does seem to have more full sized products and the bag seems a lot more useful than the box. But overall, I really liked this month’s subscription boxes/bags and I really enjoyed the very pink and feminine theme. What do you think of this month’s themed subscription boxes? The ipsy bag this month is so cute! Love your detailed review and Ipsy has done it again with another cute pouch! Loving that Naked pigment ❤ Haha I have a similar one from MAC, and it's really pretty when you pick up just a bit with your finger and dab it in the center of your eyelid 🙂 It makes for a really pretty glow, especially for parties or dinners! Looks like this month’s back was full of awesome products! Would love to try out that mud mask too!